Certain segments, such as real estate or the cannabis industry, have unique regulations and specific customers that benefit from specialized CRM. factoring in the unique regulations and guidelines of the two industries, however, selling a strain of pot or a cozy New England colonial have more in common than you think. When deciding on customer relationship management systems, companies in specialized industries are turning their attention to software built to understand the specific complexities -- whether it's constantly changing regulations, strict security standards or industry-specific databases. With that transition, several industry-specific CRM companies are working to make customer relationship management easier for vertical markets that have built-in intricacies that would be difficult for a horizontal CRM system to manage. "Cannabis is a really tricky industry. There are a lot of unique challenges the industry faces with legislation, and it's a very specialized product category," said Joel Milton, CEO and co-founder of Baker Technologies, a Denver-based customer engagement software company focusing on the budding marijuana industry. "Another [CRM] product in another industry would need a lot of customization to make it relevant to cannabis, and no one else is really doing that well because the industry is changing so quickly." Other industries, including real estate, healthcare and government, have similar problems that make one-size-fits-all software not ideal. Industry-specific CRMs aren't a new concept, but some modern changes have helped them gain traction. "You think back 20 years ago with what Siebel Systems was doing, they had 21 versions of industry-specific CRM," said Kate Leggett, vice president and principal analyst for Forrester Research. "But they were complex and configured for that industry and, thus, really hard to maintain." A movement toward cloud hosting and a more commoditized CRM paved the way for more user-friendly, industry-specific CRM systems -- whether they are built on top of a general CRM platform or built from scratch to serve a particular industry. There was this whole movement of needing these lighter-weight, industry-specific CRMs that manage the end-to-end process for an industry. "There was this whole movement of needing these lighter-weight, industry-specific CRMs that manage the end-to-end process for an industry," Leggett said. "There are some common practices that banks need, and companies are saying, 'Hey, give me the best practices for my industry,' because they want to spend their energy building customer features that will differentiate them." 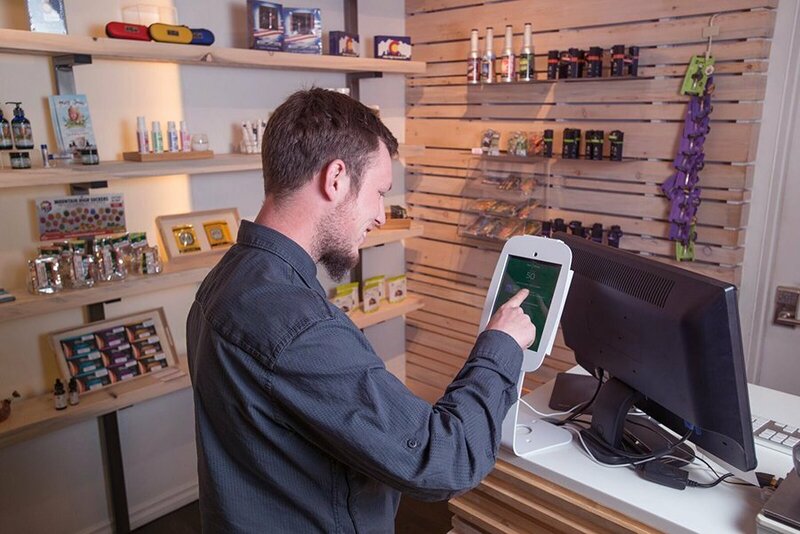 Baker started in 2014 as an app for frequent pot smokers looking to bypass the line of tourists at newly opened recreational marijuana dispensaries in Colorado, but it soon transformed into a customer engagement platform for medical and recreational dispensaries in 10 states, helping with customer retention, brand loyalty and e-commerce. There may not be an industry with more change over the past four years than marijuana. New legislation is being drafted daily, thanks to a vast shift in public perception of the plant, to several states taking steps to legalize the product and tax it as they do liquor and tobacco products, and to the increase in medical marijuana legalization. Add to that the tricky conundrum that marijuana is still illegal at the federal level, and you have a lot for a dispensary owner to keep an eye on. "Each market is so different; Colorado is different than Washington, which is different than Oregon," Milton said, adding that even within states, counties and municipalities can differ in legislation. "It's too much work to focus on each market if you're not building the software specifically for that purpose." Baker now works with more than 260 dispensaries across states that have legalized pot either medically or recreationally and instilled an industry-specific CRM. Customers with a favorite strain or cannabis product can sign up with a dispensary to receive updates and notifications via text when products are in stock or sales are happening, as well as accrue points the more they visit a particular dispensary. Baker also allows a dispensary's website to become an e-commerce site, where customers can purchase products online and, depending on the location and legality of it, have it delivered. "This notion of customer retention and brand loyalty wasn't being done well in cannabis," Milton said. "We want to help build [a dispensary's] brand and connect with their customers -- understand who they are and what they like, and send messages based on that." While there may be privacy concerns for customers -- paranoia is a known side effect of marijuana -- Milton said the type of customer signing up with a dispensary is one who typically has been smoking regularly and isn't too concerned about being busted for doing something that, at least on a state level, is legal. "[Privacy] is a concern, but it's all opt-in, and the people that are signing up are already going to dispensaries and shopping regularly," Milton said, adding that consumers are likely the last group the federal government will try to indict on buying pot. "They'll go after the dispensaries and the banks and manufacturers and software companies first. You can't arrest 10 million Americans for buying a joint." A customer signs into a marijuana dispensary that uses Baker's CRM system to increase retention and brand loyalty. While real estate agents don't have the same regulations and legality concerns as pot dispensaries, there are unique challenges to the market that make it a prime fit for industry-specific CRM systems. Between specialized databases for listing properties and the lack of need for many of the out-of-the-box features of general CRMs, real estate companies -- especially small, mom-and-pop-type companies -- can benefit from a CRM made for them. "The more general-purpose CRM tools are overkill for real estate agents," said Allen Bonde, senior vice president of marketing for Boston-based Placester Inc., a CRM platform designed for real estate. "Selling property is a complex purchase, but it also has elements of a small business. Most realtors work for themselves or a small office." As real estate has migrated from trade magazines and local listings to online, the demand for easy-to-use tools for its more than 1 million real estate agents grew. "Software is becoming more app-oriented," Bonde said. "It enabled people to specify vertical-specific functionality and say, 'I don't need a full broad SAP, Oracle or Salesforce approach; I just need these things.'" In addition to simplifying the software for real estate users, there are also some complexities that are unique to real estate, including syncing up with multiple listing service (MLS) databases, which can be a substantial investment and a difficult process. "If you want to do real estate [as a software company], you have to be willing to spend the several million dollars to build up that data feed before you can do anything," Bonde said. "The barrier to entry in real estate is getting access to the necessary MLS data. The market is unique enough that it would be tough to build an extension on to Salesforce -- I guess you could, but the core of [what real estate agents need] would be missing." Despite difficulties building on top of Salesforce for the real estate market, there are some unique industries where, after a few tweaks to a Salesforce platform, it could act as an industry-specific CRM. San Francisco-based Vlocity Inc. works with customers to build industry-specific features on top of Salesforce's CRM platform, focusing on telecommunications, insurance, public sector, healthcare and energy industries. "We take Salesforce and bring it the last mile for customers," said David Schmaier, CEO and founder of Vlocity, who also worked for Siebel Systems for 12 years. "There are sets of industry-specific business processes that the customer needs, and we add those to Salesforce." While Salesforce itself has forayed into specific industries, marketing its products for finance, nonprofits, government and healthcare, there's more that goes into an industry-specific CRM than just engineering. "You also need domain experts to understand the capabilities for that market," Leggett said. "You need a sales force that knows how to sell into healthcare, for example, and be able to talk the language." While the CRM market continues to grow, it seems as though it will be large enough for both horizontal and vertical CRMs to continue to grow, but this hyperspecialized concept is also expected to continue. "What we call industry-specific in the cloud, we think that is the next wave -- this specialization of cloud CRMs for these vertical markets," Bonde said. "It's the difference between taking a suit off the rack that doesn't fit and choosing a tailored suit." What factored into your company's decision to use an industry-specific CRM? Our chemical company uses Alchemy Cloud. Its actually a CRM for more than just sales people in the chemical space, so really a step further.